Working with outdoor professionals such as Joe Cornish and John Aitchison, a deluxe version of the much acclaimed Pájaro, the Halcon Jacket is now ready to hit the hills and wildlife hides. Great for all outdoor enthusiasts - but especially those who want lots of practical carrying space, with nine easily accessible pockets, that's four more than the Pájaro! 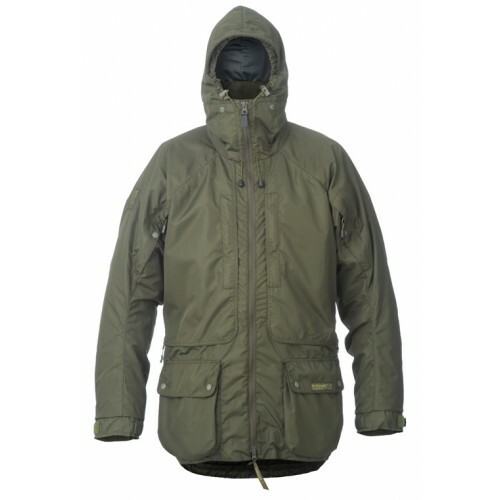 The fleece-lined collar and handwarming pockets of the Halcon provide additional comfort. The unique Analogy fabric and ventilation options ensure you can maintain your comfort without taking layers on and off. Excellent weather protection in all conditions from our unique 2” drip skirt and scooped tail. Two external secure and ‘dry’ breast pockets large enough for OS-map storage, field guides etc. Handwarming and ‘dry’ storage from two large and lined bellows pockets.